Although Real Photo postcards aren’t as colorful as their lithographed, mass-produced, counterparts, they are even more valuable to the architectural historian. Even when they are badly faded as this one is, they accurately depict what buildings and their surroundings really looked like. There is no fakery, no drawn-in trees or shrubbery or painted-out light poles. This postcard was identified only by its 1910 Rock Island cancellation, when it was discovered at a postcard show by a local collector. But he quickly recognized the house as one still standing 816 22nd Street. A bit more research led to the fact that it was written by the lady of the house, Mrs. Frederick (Rose) Titterington, to her daughter, Beryl who was attending Oberlin College in Ohio. Part of her message makes us long for conveniences of olden days…. “I will get the box off at 6 pm. They tell me it will reach Oberlin tomorrow pm.” Also implied is that the postcard, which was mailed at 10 am, would arrive BEFORE the box. Frederick Titterington was a descendent of an Edgington area pioneer family. He had moved to Rock Island in 1894, when he was elected county treasurer. During much of his adult life he was a part owner, secretary, and general manager of the Argillo Works in Carbon Cliff. Under the ownership of a group of Rock Island businessmen, the Argillo Works manufactured paving tile, fire brick, flue linings, structural tile, and sewer and drain tile, all made from a nearby bank of shale clay. The paving tile can still be spotted throughout the Quad Cities. The tiles are typically 10-12 inches square and 2-3 inches thick with an impressed geometric design. Their color and glaze is striking, a dark brown-tinged maroon, sometimes appearing almost iridescent. Mr. Titterington used flawed tile to pave his basement floor although the sidewalk from the house to the curb, now just concrete, was better quality tile. 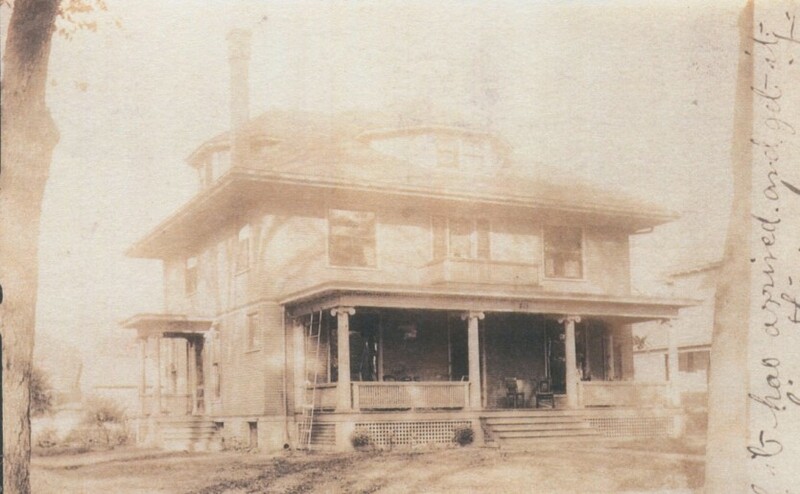 The Titterington house was built in 1904 by contractor John Volk. No architect was involved: the design was a collaboration of Mr. Volk and Mr. Titterington. In contrast to many of the older and fancier Victorian homes in this Broadway neighborhood, it is of relatively simple design. In an interview with the youngest Titterington daughter, who moved in when she was 13 and to whom the postcard was written, she said that the house was always painted white. White houses were common a century earlier, but the house color palette was later greatly expanded to encompass the popular “painted ladies” of the Victorian era. In 1893, Chicago’s Colombian Exposition brought white back to the residential streetscape. Its classically styled buildings, collectively known as the “White City,” combined the brilliance of electric illumination and elegant white buildings to create memorable scenes. Classical themes in white soon found popular expression in other buildings and homes. Although not elaborate, this house shows the classical influence in its symmetry – note the center doorway entrance. The simple large round porch columns and the small balcony atop the porch roof both evoke elements of the style. The hipped roof with four dormers is typical of a slightly different style popular between about 1905 and 1920 known as the American Foursquare for its typical layout of four rooms per story. The dormers here have an unusual roof-hugging shape. The roof, originally wood shingles, is now red asphalt. According to an llinois Historic Preservation Agency architect, early asphalt roofing was available in only three colors: red, green or black. The postcard is revealing in its details. Notice the lack of handrails on either set of porch steps, nowadays considered a safety hazard. The porch to the side provides direct entry to the dining room. This detail is common for homes of this era, although often the dining room access is through a larger side porch which also is a kitchen entrance. The front porch furniture is intriguing. There are two or three Lincoln rockers, at least one straight backed chair, and, on the right side, a hammock, hung from hooks which remain today. The chains of a porch swing can be seen at the left side. Three hanging plants and a simple, but empty, trellis bring greenery to porch sitters. But there is little other landscaping – a couple of small, unidentifiable, shrubs – perhaps since the photo was taken soon after construction. The booklet is especially valuable in its lists of plants – trees, vines, shrubs, as well as flowers — that were popular in Rock Island. For example, it says that the trellis probably supported either a climbing rose, or a vine such as clematis, honeysuckle, or Chinese wisteria. Other vines such as trumpet vine and Virginia creeper were also popular, but their growth is too exuberant and uncontrollable for this area. There is much to be learned about historic landscaping and plant use from 1830 to 1945 when you pick up a copy of this booklet. This article by Diane Oestreich is slightly modified from the original, which appeared in the Rock Island Argus and Moline Dispatch on August 3, 2003.